[S]urrounded by rugged mountains that subtly change colour as the day unfolds, Aqaba is Jordan’s only port city. Its’ abundant marine life and pleasant climate, with moderate temperatures in winter and fresh cooling sea breezes in summer, make it an ideal location for year round scuba diving, snorkelling and other water sports. 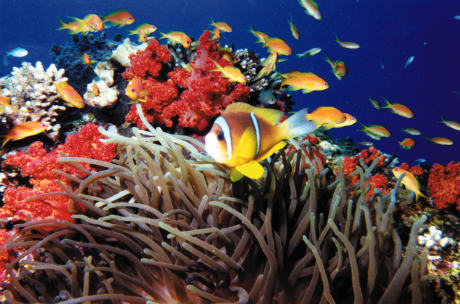 The Red Sea’s unique marine ecosystem includes more than 140 species of coral and countless varieties of brightly coloured fish, some of which are unique to the region. [A]qaba’s Royal Diving Centre and several other qualified diving operators offer complete diving services including PADI and BSAC courses; equipment rental and fully supervised dives to some of the finest dive sites in the world. Aqaba is a fun place to stay. It is a microcosm of all the good things Jordan has to offer, including a fascinating history with some outstanding sites. Aqaba has always been a prime crossroads for land and sea routes from Asia, Africa and Europe and because of this vital function, there are many historic sites to be explored within the area, including what is believed to be the oldest purpose-built church in the world. Aqaba International Airport is situated just 20 minutes from the town centre. From there, the borders of Israel, Egypt’s Sinai and Saudi Arabia are no more than a 30-minute drive.